Having read both Driving over Lemons and A Parrot in the Pepper Tree, and thoroughly enjoying both, it makes perfect sense that I should immerse myself in the third book in this series. The book itself takes a slightly different approach the previous two. 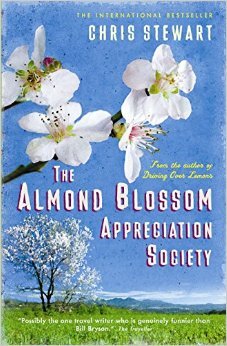 Whereas they followed a very obvious linear narrative, Almond Blossom tends to skip around in time. We start off joining Chris in the present time before going back in time for an excursion to Morrocco that Chris had taken prior to the birth of his child. When we return the present we are left with much musing on the future. The focus of the book is less concentrated on just the farm and more on people and events that have held some bearing on the writer's existence in Spain. I think as a result you would need to have read the first two books in order to fully understand the setting and all its idiosyncracies. There is a sense that this will be the last time we hear from El Valero, Stewart's farm, as this book seems to bring about a firm sense of closure to his family's adventure in Spain. This book is well worth a read for those who have followed the story so far, but for an occasional reader, picking up a book in this series for the first time, its lack of linear narrative may be off-putting.